The Southern California News Group recently published my article with an update on illegal immigration policy in California. As a local City Council member, I hear from people who have questions about illegal immigration. To get answers, I recently attended a town hall event for public officials that was organized by the office of Rep. Grace Napolitano. The meeting presented facts about the current status of illegal immigration policies in California. The key speaker was Jorge R. Field, acting deputy field office director for U.S. Immigration and Customs Enforcement. Mr. Field is a 20-year veteran of ICE and works in the Enforcement and Removal Operations department at the Los Angeles office. Napolitano referred to Field as her “go-to person” when constituents contact her regarding immigration concerns. During the meeting, we learned that ICE has two separate divisions with different staff, protocol and funding. Homeland Security investigates a range of immigration issues deemed potential threats to the national safety of the United States, while Enforcement and Removal Operations, or “ERO,” is responsible for maintaining compliance with immigration laws and removals. ICE ERO’s mission is to locate and deport individuals who are in the United States illegally, and they prioritize cases of those who have been recently released from incarceration. These are individuals who have had their cases heard in court, completed the appeals process, were found guilty, served time and are now eligible for deportation. ICE is a federal agency and does not receive state funding. California laws limit ICE access to convicted criminals and, as a result, ICE does not ask for information or assistance from local law enforcement. ICE follows a “Sensitive Locations Policy” that prohibits making arrests at California schools, hospitals and churches. Deferred Action for Childhood Arrivals, or DACA students cannot be arrested unless they commit crimes or violate the terms of their status. ICE does not conduct raids, pay bounties or participate in police checkpoints. In California, local police have an issue with many residents who are here illegally not reporting crimes or coming forward as witnesses because of fear of deportation. In an effort to address this problem, local law enforcement are not tasked with handling immigration work. They do not arrest, detain or deport undocumented residents unless they have committed a crime, and they are not in cooperation with ICE. Recently, two laws were passed at the state capitol in Sacramento that dramatically changed the way ICE is able to interview and make arrests in California. The Trust Act and Truth Act prohibit police, the county and the state of California from sharing information with ICE about “convicted criminal illegal aliens.” Rather than being deported immediately upon completion of their sentences, these individuals are now allowed to return to the community, and ICE must search for them within society. There’s no denying this ballot is overwhelming. I urge you to take a deep breath, dig in, and get knowledgeable about your choices. I’ve recently received numerous requests for voting recommendations. It appears that most people are informed about the candidates and know who they prefer. However, they want information about the 17 California state propositions, 2 county measures and 8 judges who are on our November 2016 ballots. Senate Bill 1298, called “Local Government: Fees and Charges,” is proposed legislation moving rapidly through the CA State Assembly and Senate in Sacramento. It aims to create a loophole in Prop 218 so that stormwater assessments can be added to property taxes without being placed on the election day ballot. It could open the door to dramatic property tax increases that avoid the standard 2/3 voter approval. If you are concerned about losing your right to vote on new property tax assessments please read the details below and contact your state legislators and Gov. Brown to voice your opinion. If it passes in the Assembly and Senate this month, it will be sent to the Governor in September for his signature or veto. In 2012, the LA Regional Water Board mandated groundbreaking stormwater requirements for all cities in the county. The mandate, called a MS4 Permit, requires extensive new infrastructure and is estimated to cost more than $20 Billion over the next 20 years to implement. While we all want to conserve water and prevent pollution from reaching the ocean, there is currently no budget to pay for the new systems. The City of Glendora has estimated costs at $233 million. In order to create a revenue stream, Senator Robert Hertzberg of the San Fernando Valley wrote Senate Bill 1298 so that stormwater costs can be added to property tax bills. While it would create much needed funding, it is constitutionally questionable. It removes the 2/3 voting requirement for new taxes and allows stormwater assessments to avoid being placed on the election day ballot. SB 1298 aims to weaken Prop 218, the “Right to Vote on Taxes Act” which was passed by voters 20 years ago to ensure that new or increased taxes, fees and assessments would be approved by the people before being enacted. SB 1298 attempts to change the Public Utilities Code definition of “sewer service,” to include stormwater. It would allow local governments to pass the storm water management costs directly to residents via a “protest ballot” which is a non-standard vote held outside of normal election proceedings, and is historically known to disenfranchise voters. In the City of Glendora, it is estimated that a stormwater property tax assessment could average $1200 per year for residential properties. It would also impact schools, hospitals, businesses and churches. For people who are on fixed income, the elderly, and those who are struggling to meet their mortgages each month, it could be particularly damaging. The bill is a “gut and amend” which means that the stormwater legislation was stuffed into the bill late in the process. Due to this, it will not be thoroughly vetted in committees. It is moving rapidly and appears that it will be passed by the Senate and Assembly before the end of this month. It would then proceed to the Governor’s desk where many local cities are advocating for a veto. Currently, cities are sending opposition letters to Sacramento on behalf of their citizens. Local journalists on both sides of the political spectrum have also published opposition articles. It is clearly a bi-partisan issue which crosses political boundaries. If legislators want financial support from residents for stormwater managment, it should be obtained by following the standard practice of placing the measure on the election day ballot. Ultimately, it will also be necessary to find State and Federal funding for the implementation of the MS4 permit. There are many questions about the legality of SB 1298, and if it is passed there are organizations considering court challenges on behalf of the taxpayers. What is abundantly clear at the moment, is that attempting to force residents to pay for stormwater by thwarting the democratic process with not sit well with them. Below is additional background information regarding SB 1298. Glendora City leaders expressed concern July 12, 2016 over a proposed state senate bill aimed at giving local governments power to set water rates and finance storm water projects. Council member Judy Nelson and Mayor Pro-Tem Gary Boyer requested to agendize and discuss the item at the July 12 City Council meeting after business owners raised serious issues with the cost of implementing a stormwater permit possibly passed on to them. “There was such concern at the meeting amongst business owners about the potential cost that could be assessed on properties without voter approval,” Nelson said. SB 1298 could conflict with existing law under the Proposition 218 Omnibus Implementation Act. Prop 218, a California constitutional amendment, protects taxpayers by limiting how local governments and charter cities can increase taxes, fees and charges without taxpayer consent. The Municipal Separate Storm Sewer System permit went into effect in December of 2012. The MS4 permit requires municipalities to implement measures to clean polluted storm water emptied into each city’s catch basins, storm drain lines, road gutters and from curbs, but at a staggering cost. Glendora, the county and five other cities which are tasked with creating an Enhanced Watershed Management Plan for their geographical area calculated a worst case scenario for possible costs incurred by adhering to the permit, said Glendora City Manager Chris Jeffers. Los Angeles County could pay $20 billion over a 20-year period, while Glendora alone could be responsible for $233 million of that amount. If the conflicting language in SB 1298 remains, it could pass those fees down to property owners, who could see an annual fee of $1200 for “average property” sizes, Nelson said. SB 1298, authored by Senator Bob Hertzberg (D-Van Nuys), was created to “safeguard California’s water supplies by giving local governments more authority to finance local water projects and set reasonable rates,” according to the senator’s website. The proposed bill would add definitions and change others in Prop 218, some of those changes include changing the definition of “water” to define “water service,” meaning “services provided by any system of public improvements intended to provide for the production, storage, supply, treatment, or distribution of water from any source, according to an analysis provided by the Assembly. SB 1298 also makes findings and declarations that Prop 218 was meant to improve transparency and accountability of local government fees, arguing that some court interpretations see the law as requiring local governments to manage water supplies and address water pollution, establish rates to encourage conservation and provide assistance for low-income residents, the Assembly Analysis reported. Boyer expressed great concern over SB 1298’s redefining of “water service” as too vague. “It can virtually mean anything. The idea of 218 was to really protect us and give us a say. If this bill passes, it’s going to water down Proposition 218 so much that I can see it’s almost going to be useless in the future,” Boyer added. Even with reasonable adjustments to the bill the city is seeking though, the cost to implement the MS4 storm permit could rise, Jeffers said. To what degree would be depend greatly on testing and results being done on rivers and runoff that street runoff funnels into. The League of California Cities has raised concerns over SB 1298 with Hertzberg who was receptive and possibly looking to adopt given suggestions, city staff said. The state Legislature is in recess until August and the new bill language will not be known until then. Four years ago, Staff Sgt Kenneth W. Bennett, 26, of Glendora, California, died in Afghanistan from injuries sustained when he encountered an improvised explosive device (IED) during combat operations. Kenneth, who joined the Army in 2004, was trained as an Explosive Ordnance Disposal (EOD) specialist and was on his third deployment to the region. He is survived by his parents Nancy and Ken Bennett, sister Rene, wife Mandi and 6-year-old daughter Lila Grace. Bennett’s parents are actively involved in a charity which provides assistance to veterans, and their families, who have been injured or made the ultimate sacrifice. To learn more about EOD Warrior Foundation, and the difference it makes, please visit www.eodwarriorfoundation.org. Glendora’s Community Services Department is sponsoring a competition to design the logo for our city’s new urban trails system. The City of Glendora is currently planning an 11.3 mile network of walking trails, and the first phase is beginning. The “San Dimas Wash Urban Trail” will be part of a larger network of trails along the Little Dalton Wash, Big Dalton Wash and the San Dimas Wash. Please see the flyer and link below for more information. Good Luck! On Thursday evening, Jan. 14th, a gathering of 40-50 people met at the Village Eatery to discuss matters related to Glendora’s governance. This was Glendora’s 2nd Community Conversation; the first was in October and led by Council Member Gary Boyer with Council Member Nelson also participating. Council Members Judy Nelson and Mendell Thompson led this recent meeting, beginning with a brief overview of the organizational makeup of our city (graphic shown below) to emphasize the importance of citizen input in government decision-making. California’s Brown Act was also briefly covered in order to explain why a maximum of only two Council Members are able to attend these meetings. Attendees were then invited to raise any questions, concerns or comments they had regarding City governance. To read the topics that were discussed, as well as some follow up information I’ve gathered, please read more below. Glendora’s results are in for the first five months of Governor Brown’s Statewide Water Conservation mandates. Glendora residents, businesses, schools and the City have responded and, as you can see from the data shown below, we are successfully meeting our mandated goal of reducing water usage citywide by 36%. We are required to continue at that level through February, 2016, but we are clearly on the right track. Thanks to each of you for your efforts to conserve water. At our Sept. 8th, City Council meeting, the Council approved amending the current watering restrictions to add flexibility. Previous rules limited watering of ornamental landscape to no more than two-days a week at 10 minutes per station/zone. The new amendment permits more days and time in your watering schedule. The world is coming. Help welcome it! The Special Olympics World Games begin on July 25, 2015.7,000 athletes from 177 countries will be welcomed to Southern California for a three-day Host Town program where as many as 100 communities from San Diego to San Luis Obispo will host the delegations.The City of Glendora is partnering with Azusa Pacific University, City of Azusa and City of Duarte to serve as hosts for the World Games Los Angeles 2015. Glendora is honored to host South Africa. On Thursday, July 23 the delegation will visit Glendora with a tour of Rubel Castle, Centennial Heritage Park and other city landmarks. The community is encouraged to celebrate the athletes by participating in a hometown parade at 3:30pm on Glendora Avenue and then at 6:30 pm the day will conclude with a Concert in the Park with Elvis. Come fill the Avenue for the July 23rd Hometown Parade at 4pm. These athletes have traveled far and we would like to make them feel welcome. Make posters and bring them to the parade to cheer them on! Please RSVP at City Hall – Community Services Department by July 16th. The planning phase for the new management of the San Gabriel Mountains National Monument is underway. Once developed and approved, it will control how the 350,000 acre area is to be used. During certain stages of planning, the Forest Service solicits comments from the public. The first official comment period is open now until July 27, 2015. You may comment via the email link below or contact the Forest Service for more information. You may also request a hard copy of the “scoping letter” that explains the process by calling (626) 574-5278 and asking for Justin Seastrand, Forest Planner. What topics or concerns would you like to see addressed? Which recreation activities do you enjoy in the forest and don’t want to see limited? Are there areas that are currently closed that you would like to see reopened for recreation? Every comment will be considered, and concerns that are most frequently mentioned will receive priority. I urge each of you to take the time to let the USFS know of your desires regarding the usage of the natural resources in our backyard. Every opinion is important. One of my major concerns with this designation is that the San Gabriel River, our primary water source where Glendora collects up to 85% of it’s water, is included within the boundaries. The president’s proclamation, states that there are threatened fish and rare plants living in the river, and there is ongoing debate about whether those species will eventually be given priority over the collection of drinking water. One of my comments will stress the utmost importance of protecting this water source for drinking water. An additional concern of mine is that there has been serious conversation about creating transportation systems to bring groups of visitors from across the southland to various entrances in the Monument such as at Glendora Mountain Road, Angeles Crest Highway and Highway 39. One of my comments will stress the importance of working together with foothill cities, including Glendora, to prepare for the impact that an influx of visitors could have— where will they park, how do we provide trail and road maintenance, additional security, and how do we protect the privacy and tranquility of residents who live near the trailheads? It will be very important for Glendora and other foothill cities to work closely with the USFS on this part of the management planning process, so we urge residents to submit their comments during the June 12th—July 27th public comment window. Water conservation levels among California residential users reached an all-time high for the month of May, with Californians using 29% less water than in the same-month period in 2013. City staff will provide information on the recently adopted Emergency Drought Response Plan, Water Use Efficiency Audits, available rebates, and answer questions including those regarding Residential Gallons Per Capita Per Day (R-GPCD). 2. Turf Removal Workshop: Sat. July 11th, 2015, 10:00am – 12:00pm, Glendora City Council Chambers, 116 E. Foothill Blvd. Learn how to reduce your water usage by transforming your yard into a drought tolerant landscape. Find out how you can also receive rebates in the process. Glendora’s newly updated Water Conservation Program, a result of the Governor’s recent mandates, will be presented at this Tuesday’s City Council meeting on May 26th at 7pm at City Hall. Your attention to this meeting, along with your comments and questions will be most appreciated. The City of Glendora is mandated to reduce water consumption by 36% citywide by February, 2016. In order to successfully comply with the Governor’s order, we will need the participation of every resident and business in our City. Additionally, the City will be making significant changes to the city-wide landscape and irrigation program which will result in a changed appearance of our local landscape and, eventually, an increase to our municipal water bills. Or on your television on KGLN: Time Warner Ch. 3 and Verizon Fios Ch. 31. WE WILL BE CLEANING UP THE SAN GABRIEL CANYON. On Thursday, May 21st from 3-5pm at Glendora City Hall, the City Council will hold a Special Meeting to hear a presentation about the proposed new treatment requirements for stormwater being required of all cities within Los Angeles County. This Special Meeting is open to the public. I urge you to attend as this matter could have a painful impact on your pocketbook. The estimated “worst case scenario” cost for Glendora, over the next 10 years, is $95 million! A little over two years ago, the Los Angeles County Regional Water Quality Control Board, issued new, extremely stringent permit requirements for municipalities, including Glendora. Referred to as the MS4, or the Stormwater permit, it requires that water runoff from rain must either remain in our city or, if it leaves via the storm drains, it must not exceed stringent pollutant requirements. The MS4 permit presents major challenges for our city, requiring extensive testing and mitigation of our water control measures. By the end of this fiscal year, Glendora is expected to have spent close to $600,000 to develop a plan for complying with the requirements of this permit and to begin our monitoring program. Our city is mandated by the state and federal governments to comply with the MS4 permit but neither are providing funding. How will Glendora, along with other municipalities in LA County who face similar extraordinary costs, provide for this upcoming expense? If you haven’t already heard, the State Water Resources Control Board of California has imposed new mandatory water restrictions. Glendora households must limit water usage to 125 gallons per person per day. What does this mandate mean for residents? That depends on your water usage. Beginning with the basics, here’s how to read the details of your water bill and determine what your daily water consumption is. My family and I just returned from a three week trip to Vietnam and Cambodia. It gave us a peek into the lives of the people living there. Both are war-torn countries, and almost all of the individuals we met have family members who were killed, injured, or displaced by wars. They told us that their governments are still corrupt with fixed elections, billions of dollars misspent, lack of basic infrastructure and living conditions below the poverty level. My purpose for posting updates about the creation of the SG Mountains National Monument management plan, and the Collaborative group, is to inform citizens. I have been pleased to hear from individuals currently working in the San Gabriels to maintain trails, etc, who want to be involved in the process. Thank you! I am honored to be re-elected to City Council and will continue to serve your best interest over the next four years. I appreciate your input and take your concerns to heart. Congratulations also to Gary Boyer and Mendell Thompson who were elected. I look forward to working with both of them on the new council. I would like to clarify that this letter was written without my cooperation. I had previously declined a request from the Examiner to reprint my blog in their paper. I am not interested in negative campaigning or brinksmanship. 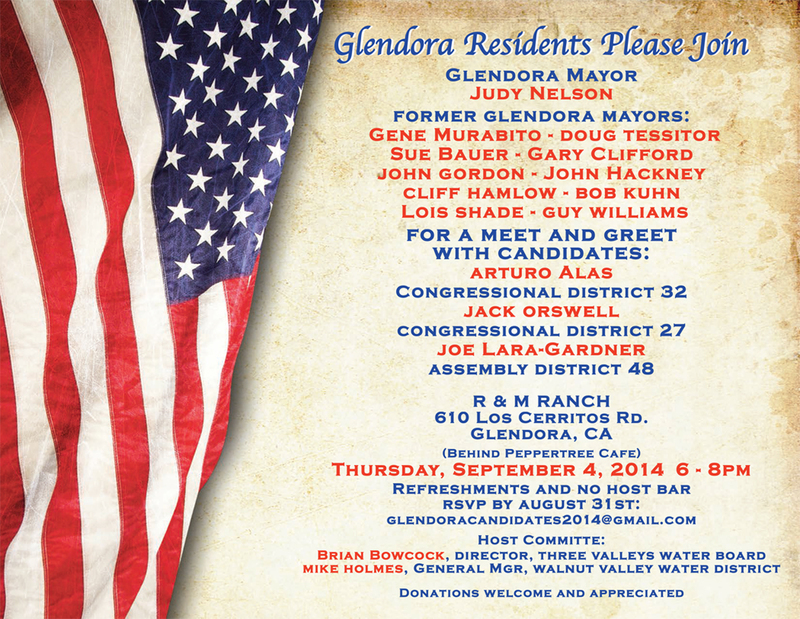 The City of Glendora has excellent candidates who are running for city council and my aim, if re-elected, is to have a good working relationship with each of them. A water conservation update and request for a budget increase for fiscal year 2014-2015 of $158,000 to fund the water conservation and turf removal rebate program. A report on the National Forest Foundation’s (NFF) efforts to establish a San Gabriel Mountains Community Collaborative Group to assist in the development of a proposed land management plan for the newly created San Gabriel Mountains National Monument. This includes a request by Mayor Nelson to be confirmed as the City’s representative to the NFF Community Collaborative Group. An update of the November, 2014 through May, 2015 City of Glendora Strategic Plan and Objectives. There is no New Business on the Agenda. Upcoming meeting agendas are posted on the City website prior to each council meeting, along with video archives of prior meetings. I am often asked who I’m endorsing for the upcoming Glendora City Council election. There are six candidates running for three open seats: Michael Allawos, Gary Boyer, Erica Landmann, Joe Santoro, Mendell Thompson, and myself. From the start, I made a decision not to make any endorsements during this election. I have also declined opportunities to attend joint fundraising events. If given the honor of serving again, my goal is to have a positive working relationship with all of the council members. Therefore, I prefer not to campaign in opposition to any candidates. I trust Glendora residents’ abilities to research and make their own decisions regarding who they choose to represent our city. With that said, I feel it necessary to clarify that a recent mailer was sent to homes with my photo, listing me as an endorsement along with nine former mayors. I’m sure it was an over-sight, however I’d like to maintain my message of neutrality. Each of my fellow candidates have certain strengths to offer Glendora. I wish them all the best in the upcoming March 3rd election. The City has heard from many residents who have concerns about the size and scope of current development projects in Glendora. At the Council’s request, a Development Town Hall meeting will be held this Wednesday evening at 7pm at Bidwell Forum. There are currently 11 projects in various stages of planning and construction within city limits. The City’s Planning Director Jeff Kugel will discuss those projects and offer information about the background and purpose of the “Route 66 Specific Plan” which guides development along the Rt. 66 corridor. The goal of the meeting is to explain the development process, answer questions and seek citizen input. Comment cards will be distributed to attendees and will be read and responded to following Director Kugel’s presentation. Your input is important. Please take advantage of this opportunity to learn and to let your city representatives know what your thoughts are. One of my personal goals as a City Council member has been to encourage residents to participate in local government. There are many decisions being made by council and staff that effect the day to day lives of the citizens we serve. I am particularly focused on giving young people an opportunity to be involved. During the summer of 2013, I implemented an internship program for college students who are interested in how local government operates. My interns have the opportunity to witness first hand how policy is made, how these policies directly effect citizens, and how the decisions made by state and federal agencies can impact our local city government. I am happy to talk with any students who might be interested in interning with me. New storm water regulations are going into effect for all of Los Angeles County. At the end of 2013, the LA County Regional Water Quality Control Board implemented extremely stringent clean water permit requirement for all municipalities, including Glendora. Referred to as the MS4, or the Stormwater permit, it requires that water runoff must either remain in our city or, if it leaves via the storm drains, must not exceed new pollutant requirements. The 1972 Clean Water Act mandates that each state implements a permit system for regulating and treating sources of water pollution. In Los Angeles County, the LA Regional Water Quality Control Board consisting of seven members appointed by the Governor, governs this system. Glendora has done a good job of complying with past MS4 permit requirements by monitoring and making continual improvements to our water control measures as needed. The challenge is that the new MS4 regulations are much more stringent than in the past and, if runoff exceeds permit requirements, hefty fines can be assessed. This presents major challenges for our city, requiring us to set up an extensive new water testing and mitigation program. In 2014, Glendora spent close to $300,000 to develop an initial compliance plan and start the first phase of testing. The annual cost to our city for complying with this permit could be in excess of a million dollars. Many Glendorans are expressing concern about new construction in our city, particularly the large scale Avalon Bay project on the NE corner of Rt. 66 and Glendora Ave.
Over the past 7 years, the loss of state redevelopment funds in combination with the economic recession resulted in very few new real estate developments in Glendora. Recently, with the increase of the housing market, developers have returned to our city. The Avalon Bay project was guided by the “Route 66 Corridor Specific Plan” which was initiated in 2000. The Plan was three years in the making and received input from “The Alosta Corridor Committee,” which was a group of citizens, staff and council members. It was approved by council in 2003 and since then, has been the standard used for planning new development in the area. At City Hall this Tuesday, January 13th, 2015 at 7pm, there will be an important city council meeting. We will be discussing and voting on two related items: 1. Is it time to review the Rt. 66 Corridor Specific Plan? and, 2. Should we hold a Town Hall meeting for residents regarding development? You are invited to attend this upcoming meeting to give your opinion during public comment, or you can contact the council in advance. The Rt. 66 Plan encourages high density development in order to meet the needs of the city such as bringing young families to Glendora to increase dwindling school enrollments, support local businesses and raise municipal revenue. The plan also aims to place housing near the future Gold Line train station so residents can easily commute to work. The five-story, 280 unit Avalon Bay project met the criterion of the Rt. 66 Corridor Specific Plan and did not require any variances to be approved. For the past several years, I have spoken with our city manager and council regarding a review of the Rt. 66 Corridor Specific Plan to ensure that it still meets the needs and desires of our residents. One of my particular concerns is that The Plan does not allow for set-backs of more than 10 feet, which requires buildings to be close to the sidewalk with minimal landscaping. The Plan also allows for 5 story construction, which can block views of the foothills. A review of The Plan has not received much support, and very few residents have attended council meetings to voice their opinion. If these matters are important to you, please become involved. Local government requires that three groups —city council, staff and citizens— all actively participate in the decision making process to achieve a well-rounded outcome. Upcoming meeting agendas are also posted on the City website, along with video archives of prior meetings. For the past three months, each council meeting has had an in-depth presentation and discussion of various developments in process with the city. These videos are available for viewing on our website and residents are welcome to offer their feedback. Peace, Prosperity, Happiness and Health to all in 2015. Glendora is holding a local election for city council this upcoming March and the application process for candidates is currently under way. My first term as a councilmember will be completed in a few months, and I’ve decided to enter the race for a second 4-year term. There will be three open seats available. As of now, 6 other Glendorans have also pulled papers to run. The deadline to enter is Dec. 17th and the campaign season officially starts on January 1st. I appreciate your support and look forward to representing you on city council for another term. On Thursday, Nov. 13th, the Los Angeles Economic Development Corporation held its 19th Annual EDDY Award Celebration at the Beverly Hilton. The City of Glendora was honored to receive the Most Business Friendly Award for a city of 65,000 or less residents. The City of Glendale was honored for a city of 65,000 or more residents. Attached is a Time Warner Cable interview about our city. It was filmed when we were one of the top 5 finalists, before the winner was announced. Also attached is my acceptance speech at the event. Misuse of the Antiquities Act? I recently had an editorial published in the San Gabriel Valley Tribune regarding misuse of the Antiquities Act in relation to the San Gabriel Mountains. I’m including the direct link to the article, as well as my unedited version below. Presidential Misuse of the Antiquities Act? On October 10th, 2014, President Obama designated 350,000 acres of the San Gabriel Mountains and River as a national monument. This action was prompted by a request from Representative Judy Chu (D-27) to create the monument by executive order because her legislative bill, HR4858, the “San Gabriel Mountains Recreation Act” had stalled in Congress. Just seven weeks after Rep. Chu announced her request, President Obama signed the monument into effect. Obama used the controversial Antiquities Act of 1906 to create the monument. This act allows a president to rapidly create a national monument without congressional approval. The designation was proposed only 7 weeks prior to enactment, and was rushed through so quickly that the LA County Board of Supervisors, the Mayor of Los Angeles and cities throughout the San Gabriel Valley did not have an opportunity to state a formal opinion before it was signed into effect. Now that the monument has been enacted, the Dept. of Agriculture in Washington DC is tasked with creating a new management plan which is projected to take at least three years. The San Gabriel Mountains are a vital natural resource and have been included as part of the Angeles National Forest since 1908. US Forest Service rangers have been protecting and preserving the area for over 100 years. The mountains are not in danger that would require an emergency order of protection, and any isolated issues with trail maintenance, signage, or litter are handled by the USFS or volunteers from local organizations. To create a new bureaucratic overlay with unknown outcomes and expense was unnecessary. The San Gabriel Mountains are directly adjacent to the greater Los Angeles metro area, and the new monument raises many issues regarding drinking water rights, recreation access and land management that could have benefited from prior discussion with local stakeholders. However, this did not occur because when a national monument is created with the Antiquities Act it can be done without any public input, studies or reviews. It does not require a vote or written legislation. This is the 13th national monument that the President has signed into effect with the Antiquities Act of 1906. This legislation was created to allow presidents the power to quickly protect objects or structures that are in imminent danger of destruction such as cliff dwellings, pueblos, and other archeological ruins (hence the name “Antiquities Act”). The legislation states that monuments should be created from “the smallest area compatible with the proper care and management of the objects to be protected.” Presidential authority regarding size was supposed to be narrow and limited. Large-scale designations over 5,000 acres, such as the San Gabriel Mountains, were expected to be voted on by Congress to allow for the democratic process to occur. While it has been publicized that this monument was many years in the making, nothing could be further from the truth. It was less than 7 weeks from proposal to enactment. Many are confusing it with Rep. Chu’s HR4858, the “National Recreation Area Act,” which was submitted to Congress in June of this year. Currently, HR4858 is being reviewed by the Congressional Natural Resources Committee and does not have enough support to pass due to many concerns regarding the potential impacts it could have on management of the mountains and rivers. Two months after submitting her bill to Congress, on August 18th, Rep. Chu announced that she had urged President Obama to use his presidential power to create a San Gabriel Mountains National Monument in order to bypass the congressional stalemate. However, a national monument designation created by executive order lacks written management guidelines and is not interchangeable with a bill that is vetted by Congress. One of the major concerns with this monument designation is that the San Gabriel River has been included within the boundaries. The river provides approximately 30% of the drinking water for the Los Angeles region and several foothill cities rely on it for up to 85% of their water. The river allows many cities to be largely independent from importing expensive water from Northern California. Unfortunately, we now have no written assurance that the collection of water from the San Gabriel River will not be restricted. Included in the President’s National Monument proclamation is this concerning statement: “The San Gabriels’ rivers not only provide drinking water but are also areas of high ecological significance supporting rare populations of native fish, including the threatened Santa Ana sucker. The San Gabriel River supports rare arroyo chub and Santa Ana speckled dace, a species found only in the Los Angeles Basin.” Similar to how water is being restricted in California’s Central Valley, due to protection of the Delta Smelt, it is now entirely possible that the protection of these indigenous species will take precedence over water collection and recreation access in the San Gabriels. Often, new national monuments come hand in hand with increased entrance fees, restrictions on the types of recreation allowed, and limitations on access to certain areas. The USDA’s FAQ sheet says that usage and access will occur to “the extent consistent with the proper care and management of the objects protected by the designation and subject to the Secretary’s special uses authorities and other applicable laws.” Although we have received verbal assurances from Rep. Chu that nothing will change with the management of the San Gabriels, the terms will not be placed into writing until the Secretary of Agriculture creates the plans, and even then the directives can be changed by future presidents as they see fit. Now that the monument has been signed into effect, it is important to turn our attention to the creation of the new management plan. The USDA states that “within three years after the designation, a management plan will be developed with public input. The management plan will be developed and implemented…in an open and transparent process. The Sec. of Agriculture has directed the Forest Service to provide for maximum public involvement in the development of the plan.” If nothing is expected to change, as Rep. Chu states, it begs the question as to why it will take three years to create a plan and why the designation was necessary in the first place. Regional cities, community organizations and citizens are advised to notify the U.S. Forest Service and their elected officials that they would like to be included in any upcoming planning meetings to ensure their voices are heard. We cannot take it for granted that our needs will be represented without active involvement in the decision making process. In June of this year, Representative Judy Chu introduced a bill to Congress, HR 4858, the San Gabriel National Recreation Area Act. It was referred to the Congressional Natural Resources Committee and it is clear that it currently does not have enough support to move on. On August 16th, just 2 months after submitting HR4858 to Congress, Rep. Chu announced that she asked President Obama to use his executive power to create a San Gabriel Mountains National Monument, using the controversial Antiquities Act of 1906. This past Friday, October 10th, President Obama signed a proclamation designating 350,000 acres of the San Gabriel Mountains as a National Monument. This is the 13th time our President had used his executive power to designate a national monument. While it has been publicized that this monument was many years in the making, that could not be further from truth. It was implemented less than 7 weeks after it was announced. Some are confusing it with Rep. Chu’s National Recreation Area Act which did in fact undergo many years of study and input. The National Monument designation is different from the National Recreation Area bill and must not be considered the same. It does not have any written legislation to guarantee water rights, land management or recreation access. President Obama takes helicopter tour of the San Gabriel Mountains? Numerous residents saw three military helicopters flying in formation over the San Gabriel Foothills yesterday, presumably giving President Obama a tour of his latest National Monument. This will be the 13th time our President has used an executive order to create a National Monument. Please help us rally to show opposition as President Obama prepares to sign the San Gabriel Mountains National Monument into effect. This will be the 11th National Monument that President Obama has designated with an executive order. On Friday, October 10th, 2014 the President will be holding a press conference at Bonelli Park in the San Gabriel Valley to announce his plan to use an executive order to create a San Gabriel National Monument for over half a million acres of mountain and foothill land. On Monday October 6, 2014 at 2pm the field office of Congresswoman Judy Chu will hear from a growing movement of citizens and elected officials against her lobbying efforts to have approximately 620,000 acres of the San Gabriel and San Bernardino Mountains designated as a national monument. They will deliver letters of opposition to Representative Chu and local groups will speak out against the plan during a media event outside Rep Chu’s office at 527 S. Lake Ave, Pasadena CA 91101. Rep. Chu currently has a bill, HR4858, being reviewed by a Congressional committee to designate the San Gabriel Mountains as a National Recreation Area, however she hopes to bypass the legislative process and have President Obama declare the mountains a National Monument with an executive order as early as this month without proper studies or public input. San Bernardino County supervisors unanimously expressed serious concern for the impact of Rep. Chu’s plan on their county. Several Los Angeles County supervisors have also expressed concern over Chu’s legislation. Residents and public officials have created a grassroots movement against Chu’s campaign for further federalization of local lands. Elected officials independently opposing the National Monument designation are City Council members from the municipalities of Arcadia, Bradbury, Claremont, Diamond Bar, Glendora, La Verne, Monrovia, Rosemead and West Covina. Local leaders have concerns over the impact to our water supply if the San Gabriel River is included in a National Monument. Recreation access and land usage may be restricted if this plan is implemented. Winter sports, off road biking and hiking, atvs, rifle ranges, horseback riding and many other activities and businesses could be curtailed. Other groups attending and delivering letters of opposition will be the California Trail Users Coalition, Pasadena Bait Club, Public Lands for Public People, SoCal Cycling, Mt. Baldy Lodge, Off-Piste Hikers, Glendora Community Conservancy, San Gabriel Valley Regional Conservancy (SGVRC), and California Off-Road Vehicle Association (CORVA). Tuesday, August 26th from 4:00-7:30 p.m. at the Baldwin Park Performing Arts Center, 4640 North Maine Avenue, Baldwin Park, CA 91706. The Associated Press recently reported that the State Water Resources Control Board completed a survey of 276 large water districts throughout the state of California. The SWRCB listed Glendora as the number one water conserving municipality in Southern California for the month of May with an overall reduction of 26%. Glendora was second in water reduction for the entire state of California with only the City of Folsom, in Sacramento County, coming in first. The City of San Francisco posted a 19% increase in water consumption for this same time frame. – City of Folsom (Sacramento County), 31 percent. – City of Glendora (Los Angeles County), 26 percent. – City of Gilroy (Santa Clara County), 25 percent. – American Water Company (Sacramento County), 24 percent. – City of Pleasanton (Alameda County), 23 percent. – City of Ceres (Stanislaus County), 22 percent. – City of Santa Rosa (Sonoma County), 22 percent. – Sacramento Suburban Water District (Sacramento County), 21 percent. – American Water Company (Monterey County), 20 percent. The City of Glendora made news recently for mailing a “fix it” letter to a resident with neglected landscaping. The City had received an complaint about the dead yard and we delivered our standardized landscape maintenance letter on July 15th asking them to keep their yard “healthy and green.” On the same day that the flyer was delivered, the California State Water Resources Control Board (SWRCB) issued Emergency Drought Regulations, which increase restrictions on water usage. In order to reflect the intent of the new regulations, the City has revised its flyer with no mention of fines. While the CA State Water Resources Control Board has suggested that fines be issued for excessive water usage including allowing water to run off into the street when watering yards, they do not suggest that residents let their yards die. Blighted landscaping can lead to plummeting property values for neighborhoods. Even with a severe drought, it is possible to have a landscaped property that is both visually appealing and compliant with conservation efforts. The City of Glendora partners with the Municipal Water Department to offer rebates for turf removal and drought resistant landscaping. “Xeriscaping,” which is the use of low-water plants, is a good option for residents who would like to utilize the current rebates for turf removal. The City of Glendora takes the drought and need for water conservation very seriously. The Associated Press published a report on July 16th, regarding the “Biggest water saving and guzzling districts in California” based on a recent survey by the SWRCB of 276 large water suppliers (those with over 40,000 customers). Glendora was listed as the number one water conserving municipality in Southern California for the month of May, with a 26% decrease in overall consumption. Of all 276 survey respondents throughout the state, only the City of Folsom in Sacramento County conserved more water than Glendora for this time frame. Our city has reduced water usage consistently since 2008 when we implemented Stage One Water Conservation elements. We are further committed to lowering consumption beyond the SWRCB recommendations of 20% by 2020. Our goal is to seek voluntary compliance with the water conservation mandates and to assist residents in finding solutions they are happy with. Glendora has a Water Conservation Team on staff that is available by request to meet with residents free of charge to discuss ways they can conserve water while keeping their property well maintained. The City of Glendora is committed to reducing it’s overall water usage and is working with residents and businesses to assist them with conservation measures. The City’s Water Conservation Team offer’s free home consultations to advise residents in ways they can conserve water including rebates for turf removal. To schedule a personal visit please call: (626) 852-4838. Due to the drought, the City of Glendora is currently partnering with the Metropolitan Water District to offer property owners rebates for turf removal and installation of drought tolerant plants. We encourage residents to scale back water usage throughout their homes and yards through conservation measures. While it may seem that we should let our yards go brown, water conservation need not diminish a city’s aesthetic appearance. Now is a good time to consider Xeriscaping, which can reduce water usage as much as 60% and adds value to the property. The term Xeriscape is derived from a combination of the words “xeri” and “scape”. The work “xeri” comes fro the Greek work “xeros” which means dry. “Scape” means scene. Even though this translates into “dry scene” it does not fully define the possibilities of Xeriscaping. There are many aspects to this type of gardening, but at its essence it involves the use of plant materials that are appropriate for the region and water availability. 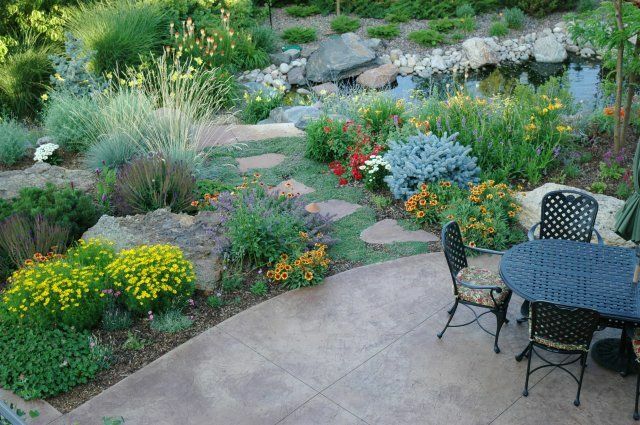 However, Xeriscape is not necessarily barren, desert, arid, or anything else that you might associate with dry climates. It is possible to have a lush display of plants that are compatible with their environment and are part of a well planned Xeriscape. When water restrictions are implemented by a municipality, xeriscape plants will tend to survive and thrive, while more ornamental plants or lawns may be unable to adapt. Congresswoman Chu recently submitted her San Gabriel National Recreation Area bill to Congress. It is now officially referred to as H.R. 4858 and was sent to the House Natural Resources Committee. From there it has been sent to the Subcommittee on Public Lands and Environmental Regulation. You are able to zoom in and out of the map in order to see exactly where the boundary is. However if the bill is enacted, the legislation is worded so that the map boundaries can still be altered. For Glendora, it appears that the current boundary has been moved to the base of the foothills. The boundary includes the San Gabriel Mountains and homes in the hills as well as Glendora Mountain Road and Big Dalton Canyon. • The San Gabriel River, which provides most of Glendora’s water supply. • Glendora Conservancy owned land on Bluebird Hill and Colby Trail. The Conservancy land is a valuable resource for Glendora and is protected and cared for by a non-profit, volunteer run Glendora organization. I am requesting that it be removed from the NRA boundaries and, if you see fit, please do the same. If you would like to voice your opinion on this legislation, now is the time to contact Congress. The best way to reach them is by fax or phone—emails from outside the district they represent are blocked and mail can be delayed while it is being inspected for safety of the contents. The Glendora Chamber of Commerce held a town hall meeting on May 21st 2014 to discuss Congresswoman Judy Chu’s proposed legislation to 1). Create a San Gabriel National Recreation Area, (NRA) 2). to designate portions of the San Gabriel Mountains as Wilderness and 3). to designate portions of the San Gabriel River as Wild and Scenic. If passed, the NRA legislation would place a National Park overlay upon approximately 621,860 acres of the San Gabriel and San Bernardino mountain ranges, and the San Gabriel and Rio Hondo Rivers as far south as Puente Hills. Urban areas 1/4 mile on either side of the river and portions of foothill cities will be included. On April 22nd 2014 the Glendora City Council voted 3-1-1 to support the proposed National Recreation Area legislation by Congresswoman Judy Chu, CA district 27. 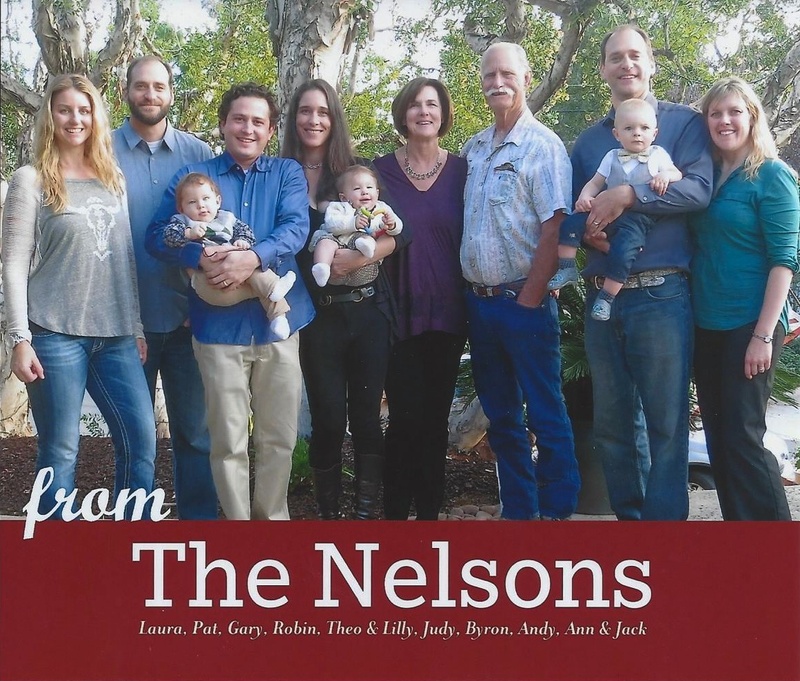 The lone nay vote was cast by Mayor Judy Nelson. The video runs 1 hour and 40 minutes. 1:34:48 Mayor’s motion to inform the public and not support the legislation yet- Not passed. 1:36:33 Mayor Pro Tem’s motion for the city of Glendora to officially support the legislation- Passed. I had the good fortune of being interviewed by Mr. Jerry Kitchel of the Glendoran Magazine for this month’s cover story. “As a resident of Glendora for the past 34 years I proudly and humbly accept the position of Mayor. I look forward to representing our beautiful city and its citizens.